Today we met with a travel agent. She is a specialist in Hawaii vacations. Or not. Matte and I have some ideas on where we want to go in Hawaii and one place is Hana. We found an awesome place to stay that was ranked the #2 spa in all of Hawaii by some magazine that ranks that sort of thing. The problem with Hana (not a problem for us, really, we kind of like that “problem”) is that it’s basically in the middle of nowhere, very secluded. To get there by car, you travel the Hana Highway, which is beautiful and offers gorgeous scenery. We definitely want to cruise along that road, but neither of us is too excited about sitting in a car for three hours right after we get off the plane, so we figure we’ll stay in Kaanapali for the first night, and then hit the road to Hana the next morning. Because there’s not much to do in Hana, we want to go somewhere else after just a couple of days, either spend more time on the other side of Maui, or head off to the Big Island. But then again, it’s a three-hour drive back to the Kahului airport. I suggested to the travel agent that we depart from the Hana airport when we’re ready island hop, rather than trek all the way back to the main airport on the other side of Maui. I mean, it’s right there. We can even return our Kahului airport-rented car there, in Hana. Uhm…yes. Yes, there is. And you can take inter-island flights for as low as $30 each way even. But the Hawaii specialist had never heard of an airport in Hana. Also? When she recommended a place for us to stay on the first night in Maui, she put us at a hotel that caters to families, where Kids Stay Free! Uhm…what about the part where I said we want more seclusion, and to try and avoid the family-oriented places? Guess she missed that part. So yeah. I’m thinking we can book this honeymoon on our own, or go with a second recommendation I received. This is for a great travel agent that does actually specialize in Hawaii vacations, and mainly luxury Hawaiian vacations. My friend Lisa used them for her first anniversary and had a spectacular time, complete with room upgrades and welcome champagne. So tell me: do you usually use an agent to book big important trips like this? Or do you do all the research and planning on your own? Do I want to take on additional planning when I’m already planning a wedding? I know I don’t want an agent I have to second-guess. Suggestions and recommendations are welcome, both for travel planning in general and Hawaii specifically (Maui and the Big Island on this trip). Tell me what we shouldn’t miss. I wish I had advice but I’ve been on two “big” trips like this and both times my Mom handled it. We used a travel agent once but I think it’s kind of like finding a therapist- you have to find the one that works the best for your needs. Sounds like your honeymoon is going to be great though! We went to Hana with my family long ago. Just to illustrate what an “adventure” that ride would be….they sell shirts that say “I survived the road to Hana”!!! I think I would try to do it myself. Unless you know the travel agent, assume they are going to book what puts the most in their pocket. It sounds like you have it half planned already. Plan it yourself. 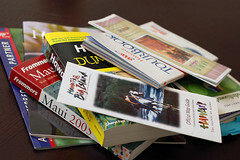 I can mail you my Fodor’s Maui book from 2000. Stay at a luxury resort in Kaanapali, book a Hana excursion from there. You can take an escorted tour, via shuttle-bus (van) to Hana so you don’t have to drive. Stop at the Seven Sacred Pools along the way and take a dip. The luxury hotels (Westin Sheraton, Hyatt regency- you can’t go wrong) they have travel agencies on site who can book you island-hopping day tours which are also fabulous. (We flew to Kauai on a day trip to see the Waimea Canyon “Grand Canyon of the Pacific” and the River – spots I remembered from my childhood that I wanted to share w my hubby) and tell everyone that it’s your honeymoon, they have to be nice to you it’s like the law. You’ll get free champagne on the plane! Dine at the Hyatt Regency near Swan Court Souvenir shop in nearby Lahaina and enjoy the Cheeseburger in PAradise. I think we daytripped to yet another island, but I can’t recall which one right now. My wife and I honeymooned in Hawaii and loved it so much we spent our first anniversary there, as well! What not to miss?? Volcanoes. Very surreal. And the coolest thing was going to local dive shops to rent snorkel gear. The knew all the best, non-tourist spots to snorkel. Some beautiful, secluded beaches. Just awesome! Plan it yourself. Agents are lame. I used one for my honeymoon and I know now that I didn’t need to. Do the research yourself on hotels.com! David and I drove the road to Hana, it’s not that bad at all. Just don’t keep going around the island, turn around and go back the way you came. And don’t bring beer. Bad idea.